For almost a decade, Weed Razer™ has delivered unique solutions to cut, clear and manage aquatic weeds, algae, muck and other unwanted material found in your lakes and ponds. This proven line of products is headlined by the Weed Razer–which efficiently cuts almost any type of rooted lake weed. It features stainless-steel blades with a specialized “V” shape to ensure the optimal position and action to cleanly slice aquatic vegetation. 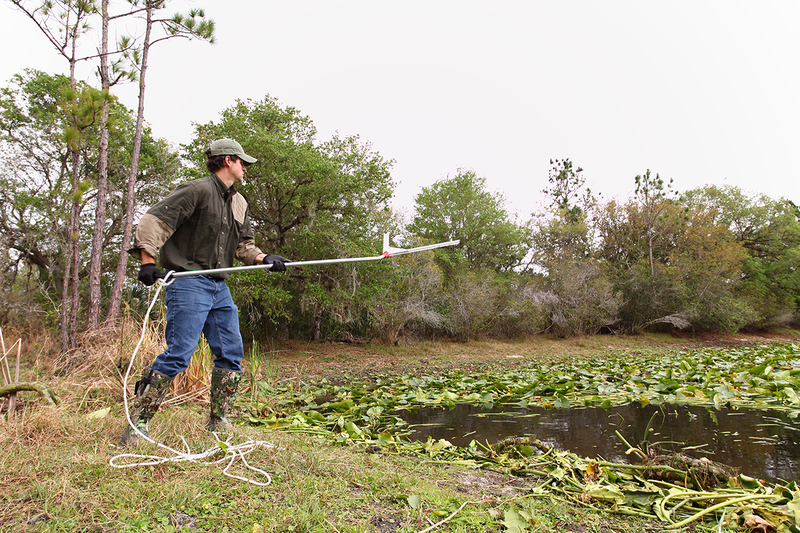 Additional versions of this weed removal tool are now available, as is a full line of products focused on removing aquatic vegetation. The History of Weed Razer and Jenlis, Inc.
Weed Razer is part of Jenlis, Inc. which was incorporated in 1999 under the name BetterMilk Inc. BetterMilk was founded to bring a calf milk pasteurizer (created in the basement of the founder’s home) to the dairy industry. In 2003 BetterMilk sold the patent rights for its pasteurizer. Eventually this led to selling other products in the dairy industry. In 2006, the company was renamed Jenlis after the names of the founder’s two daughters, Jenna and Lisa. In 2007, the Weed Razer was introduced. It was designed for cutting aquatic vegetation. This product line expanded in 2008 with the addition of the Weed Raker, a complimentary tool to the Weed Razer and has grown significantly. Jenlis has added several other brands and products in a variety of markets including hunting, land management, bars and restaurants and dairy. Today, Jenlis serves these markets all over the world. Dan Amundson still owns the company he started. He feels strongly that he was put on this earth to create products that offer better solutions. From his first days in the dairy industry to category-creating products in the outdoor market, Dan has delivered. He continues to develop product ideas around his areas of interest which include hunting and land management from his home in the bluff country of southeastern Minnesota. Awesome! This thing [Weed Raker] grabs everything out of the lake! Pallets, dead duck, beer cans and oh yeah all the seaweed! It grabs muck too but it kind of goes through the tines as your pulling. A must have if you live on a lake! Great combo with the Weed Razer by Jenlis. Have to use pull weeds to shore but then need to grab by hand the heavier clumps for fear of breaking the tines or bending. Works very well…as advertised. It’s very sharp and the weeds just float to the top. Makes quick work of an otherwise daunting task. Excellent product and delivered as promised! Thanks. [Weed Razer] Does what is says. I have used several other solutions, and this is the best so far. Comes with a steel sharpener to keep the blades sharp. The edges are sharp. What a great solution for my lake weeds! I had a very thick bunch of the smaller lilies choking up my swimming area. We tried pulling them up while sitting on our paddle boards we tried throwing a rake with a rope attached but we just couldn’t completely get rid of them so I jumped on U Tube and saw this product in action and ordered from Amazon. The very first time I tossed it out and pulled it back it cleared every weed in its path, they just floated to the surface and just a few more passes and some piles on the beach and the grand kids could swim weed free again. I just love seeing them have so much fun again and playing with them.